One of the hardest words I’ve ever had to preach came from the passage that most Christians memorize for the comfort and hope it brings them. You know the verse I’m talking about: Jeremiah 29:11. “For I know the plans I have for you,” declares the LORD, “plans to prosper you and not to harm you, plans to give you hope and a future.” Go ahead and admit it. This is your life verse. It’s the desktop wallpaper on your computer–superimposed over a kitten in a basket. It has brought you comfort in times of trouble. It has helped you to hold out for God’s best when you just wanted to give in or give up. This verse has been a sparkling promise of God, like the North Star on a dark night. But here’s the thing. This verse doesn’t mean what we think it means. When we look at the rest of Jeremiah 29, we get a very different sense of what God is saying here. We get the sense, even, that he’s saying the opposite of what we thought. You see, this verse comes within a much larger prophecy to people in exile. They had been ripped away from their homeland, the Promised Land, the holy land. They were living in Babylon, a strange country where the customs, people, and language were foreign to them. Engulfed by the unfamiliar, they longed desperately to taste, to see, to touch what they had always known. They longed to be home. Most of the prophets living with them in exile saw this and had compassion on the people. They prophesied compassionately. “Just two more years,” they proclaimed, “and God will bring us back to Jerusalem. Just two years longer and he will crush the head of our oppressors.” But compassionate prophecy is often false prophecy. The term of exile would not be two years, Jeremiah declared, but seventy. For grown men and women, seventy years is a death sentence. For all but the youngest of the exiles, this meant they would never see their homeland again. They would die in this foreign land. They would be buried by unclean hands in unholy soil. Exile is a fate worse than death. “Build houses and settle down; plant gardens and eat what they produce. Marry and have sons and daughters; find wives for your sons and give your daughters in marriage, so that they too may have sons and daughters. Increase in number there; do not decrease.” In other words, live in Babylon as though you were living in Jerusalem. Engage with your new reality. Embrace your exile. We hear this message again and again about personal greatness, about achieving your destiny, about realizing your dreams and actualizing the genius within you. And so images of personal significance and professional greatness dance in our heads as the false prophets of Christianity tickle our ears with the repackaged nonsense of Tony Robbins and the positivist promoters of a self-help philosophy that is nothing more than a theology of self where you have replaced God at the center of creation. “I’m going to do great things! …for God. I’m going to take this city! …for Jesus. I’m going to make my life count! …for the Lord.” False dreams interfere with honest living, as Eugene Peterson has said. Jesus talked a lot about losing your life, and how losing your life for his sake is the only way to really find it. Did he mean that, or was he just joking? Is that how we’re being encouraged to live these days? To lose our lives for the sake of Jesus? To surrender our dreams? To relinquish our genius? To forsake personal greatness? Are any of Christianity’s prophets talking about how to live well in Babylon, or are they all selling us roadmaps back to Jerusalem? You and I are being seduced by a Christianity that has nothing to do with Jesus of Nazareth, who grew up, lived, and died under the oppressive rule of the Roman Empire; no, we are being seduced by a Christianity that has everything to do with the cult of the self and the drive for power. We are taught that Jesus is most supremely interested in me, and making me a very important person, helping me to actualize my potential and realize my dreams. In Christian America, Jesus isn’t a Savior who died to free you from the curse of sin and reconcile you back to God; he’s a life coach that shows you how to be the best you you can be. 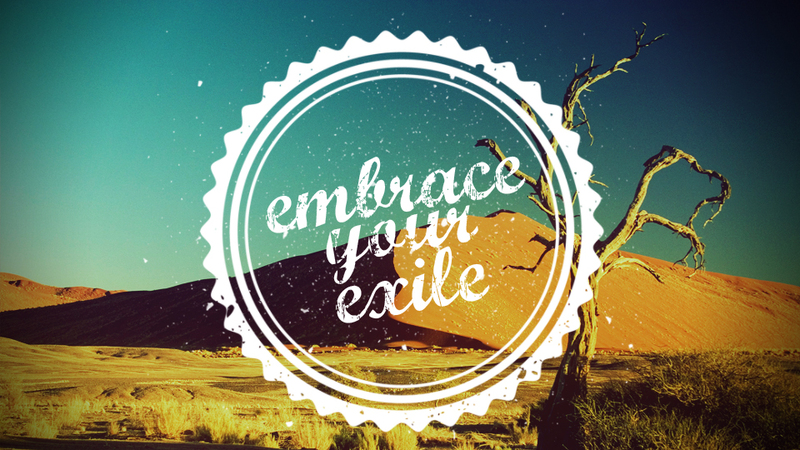 Embrace your exile. God has never promised to make all of your dreams come true. He has never told you to follow your heart. He has not guaranteed your best life now. The truth is, most of us are born for Babylon, and we need to embrace our exile or we will be miserable our entire lives, chasing false hopes and kicking on escape hatches that will never open. Can you live with Jesus if living with him means living in Babylon? Can you follow Jesus if it means you may never see all your wildest dreams come true? You cannot live God’s life for you, you cannot live life with God, if you are always trying to get out of the life you have been given. You cannot live with God if you are constantly trying to get out of your circumstances, dreaming of being somewhere else, someone else. Escape from exile is not the answer. Escape from this world, this life, these problems, is not God’s way. Every day you face the choice between comfort and depth, between escape and engagement. Every day the unredeemed desires of your heart will allure you away from the reality in which you live, to daydreams of a so-called better life. But there is no other life out there. The life you’ve been given is the only life you have in which to live deeply and thoroughly for and with God. Embracing our exile allows us to live in the reality in which God lives, the reality that he has given us, and the only place we can find him. As we embrace our exile we learn to embrace God, and trust him no matter the circumstances. God is the God of the good times and the bad. He is the God over Jerusalem and the God over Babylon. Embracing our exile means being content with God’s presence within, and oftentimes despite, the circumstances of our lives. Only by embracing our exile will we learn to live with hope, real hope that transcends our circumstances and rests not in the actualization of our potential or realization of our dreams, but in the resurrection of our bodies and life forever in the full presence of God. We look forward to a future where the victorious Jesus rules and reigns over all creation, where God’s dream has been fully realized, and where we have become fully and perfectly human, ruling and reigning with Jesus the king on this throne. And so we come back to everybody’s favorite verse: “For I know the plans I have for you,” declares the LORD, “plans to prosper you and not to harm you, plans to give you hope and a future.” So what is God’s plan? What is this prospering he promises? What does the future look like? We have hope, not because Steve Jobs rose from rags to riches and we can too, but because Jesus Christ rose from the dead and we will too. And on that day he will welcome in all who put their trust in him and not their own potential, who put their faith in him and not their own power, whose hope was in him and not in their own dreams. If you are in exile, embrace your exile. That is where you will find Jesus. There are no shortcuts to realized hope. Only by embracing your exile will you learn to live with the true and lasting hope of the resurrection of Jesus Christ. In many ways, my life is not what I wanted. My son’s health has forsaken him, leaving him a shell of the boy he was and could be. My dream of Ember Church died. Six months ago, I was fired. I am not in pastoral ministry–the vocation to which I sense that I am so strongly called, and toward which I have directed my entire life–and I don’t know when or if I will ever be again. Like many others I know, I live in an existential exile. Embracing this is hard. Daydreaming is easy. So is bitterness. My sense of entitlement drives me to dark places. But if I am to find God in this life–the only life I have–I must embrace the circumstances of the hours I wake and the ground on which I walk. I must embrace my exile in order to find God’s presence, and it’s when I find God here, in Babylon, that I am reminded that the only hope worth having will never be fully realized in a fallen world, but it awaits us as sheer grace, utter gift, on the other side of faithfulness. God’s plan for the world, and for me, is Jesus. There is no harm in Jesus. There is everlasting prosperity in Jesus. The only future worth having is found only in Jesus. That helps me. A lot. And I hope it helps you, too. watch His methods, watch His ways. How He ruthlessly perfects whom He royally elects! But every act induces Him to try His splendor out. Thanks, Toni! I certainly resonate with that poem, especially in this past year. It makes me glad, though, that even in the hammering process, God is so gentle with us. Holy crap, how did you read my mail? THANK you for this. It IS all about Jesus, and despite difficult circumstances, we still have reason for the Joy of the Lord and the hope we have in Him. Also, this is not a “zip code” message, but true for Christians all over the planet. Thank you, Lois. This message has resonated with a lot of folks. Thanks for the encouragement! I am so encouraged by you Andy. Thank you for this, my friend. Praying for us both, in those dark spaces. Great thoughts Andy. Thank you for sharing. Reminds me of what I knew but couldn’t put into such poetic terms like you did. As a Soldier I identify with the Sojourners in Exile, always longing for home, never getting to know my neighbors, moving, deploying…I have to keep telling myself it is much easier to change my perspective than to change my circumstances. Its nice to know also that I am called to it, something I didn’t realize for the last 8 years of my life, its quite simple if I am in it, I am called to it, at least for that very moment. Thanks again, this helped confirm some big decisions this week. Justin, thank you for your service. I know you have very little control of your circumstances, but I’m glad to hear that you have been able to find God in the midst of it all. Elisa, thank you for your response. I’ve tried to represent the point of Jeremiah’s letter to the exiles as faithfully as possible. Unfortunately, what he was really telling them is a lot different from how we often read this passage. God bless you! Jesus was in exile once. In Egypt. God sent him back to be crucified.